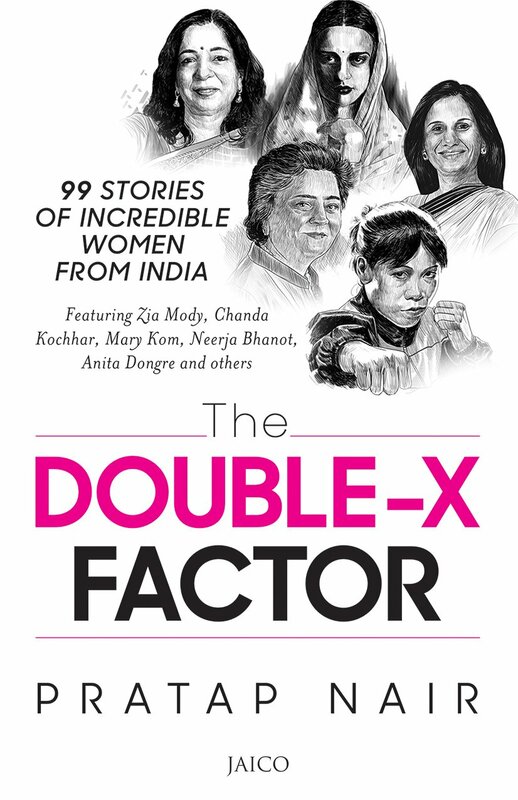 99 stories of incredible women from India. From Rani Lakshmibai and Indira Gandhi to Chanda Kocchar and Mary Kom, The Double-X Factor explores the lives and times of 99 exceptional achievers who challenged the gender barrier and rose to fame. Indian history is replete with instances of women’s valour, fortitude, courage, self-sacrifice and leadership in times of crisis. Some of them have turned into folklore and many of them have been immortalized in movies. Most of all, these women have left a great and indelible impact on several generations. Be it politics, arts, entertainment, sports or business, they carved a niche in every sphere that was once considered a male domain. Today, they have become role models to a nation of 1.34 billion, of which almost half is female. Pratap Nair is the founder of FEI Cargo, a logistics company. Shailaja Nair Foundation – FEI’s CSR arm – was established to help women and children come up in life. In today's times when movies like Lipstick Under my Burkha are banned because of having a strong female voice, such books are the need of the hour. They not only inspire you, but also show you the strength of our roots by telling you stories of the strong women we are surrounded with. From the times of Rani Laxmibai to today's leaders like Chanda Kochar this book covers them all. It is so heartwarming to see that despite all that our society went through in the past, we have time and again witnessed powerful women who have continued to beat all odds and set an example for all of us to follow. Even today there are many women in India who go through a lot in the name of society, of tradition, culture and other such beliefs. They have to sacrifice their dreams at the altar of these beliefs and continue living a life devoid of any desires. This book is a shining example of what a woman can achieve if she sets her heart on it. She derives strength from her faith in her own self. From centuries there have been so many examples where women have always been told to soften down everything ranging from their voices, tones to their dreams and desires. And I have always wondered, what are we scared of if women do all that they want to do? Though that is an answer no one has been able to provide till now, this book does show you glimpses of what all can we achieve if we believe in our dreams and continue to fight for them. The way ahead will never be easy, there will be lot of hiccups but the key lies in never giving up and that is the message of this book. Each and every story has a strong message within which makes you feel proud of having such a rich cultural heritage and also motivates you to keep aspiring. With lucid language teamed up with touching narrative, this book makes for a wonderful read. Recommended for all - men and women both because we all can learn from these exemplary women! This book is like Lauki Halwa- food for the soul, delicious, comforting and one that reminds you of home, always and all ways!